4 books in 2 volumes: +xvi+255 pages with frontispiece; 205 pages with index and errata. Octavo (8" x 5 3/4) bound in stiff wrappers with labels to spines and deckle edges. 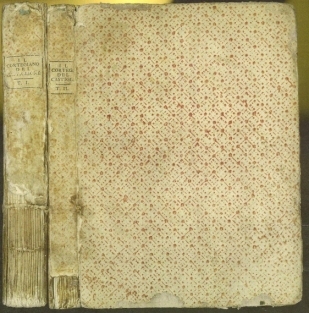 This edition not in Bibliotheca Van der Linde-Niemeijeriana; however, there are a number of listings for this title in the bibliography (4315 through 4330), listing 16 editions of various dates and publishers. First published in 1528. Baldassare Castiglione, count of Novilara was an Italian courtier, diplomat, soldier and a prominent Renaissance author. He was born into an illustrious Lombard family at Casatico, near Mantua. In 1494, at the age of sixteen, Castiglione began his humanist studies in Milan, which would eventually form his future writings. However, in 1499, after the death of his father, Castiglione left his studies and Milan to succeed his father as the head of their noble family. Soon his duties seem to have included representative offices for the Gonzaga court. For the Gonzaga he traveled quite often; during one of his missions to Rome, he met Guidobaldo da Montefeltro, duke of Urbino. Urbino was at that time the most refined and elegant among Italian courts, a meeting point of culture ably directed and managed by duchess Elisabetta Gonzaga and her sister-in-law Maria Emilia Pia. The most constant guests included: Pietro Bembo, Giuliano de' Medici, Cardinal Bibbiena, Ottaviano and Federigo Fregoso, and Cesare Gonzaga, a cousin of both Castiglione and the duke. The hosts and guests organized intellectual competitions which resulted in an interesting, stimulating cultural life producing brilliant literary activity. Castiglione wrote about his works and of those of other guests in letters to other princes, maintaining an activity very near to diplomacy, though in a literary form. In 1516, Castiglione was back in Mantua, where he married Ippolita Torelli, descendant of another ancient noble family; two passionate letters he wrote to her, expressing deep sentiment, have survived, but she unfortunately died only four years later. At that time Castiglione was in Rome again as an ambassador, this time for the Duke of Mantua. In 1521 Pope Leo X conceded to him the tonsura (first sacerdotal ceremony), and thereupon began Castiglione's second, ecclesiastical career. In 1528, the year before his death, the book by which he is most famous, The Book of the Courtier (Il Libro del Cortegiano), was published in Venice by the Aldine Press run by Andrea d'Asolo, father-in-law of Aldus Manutius. 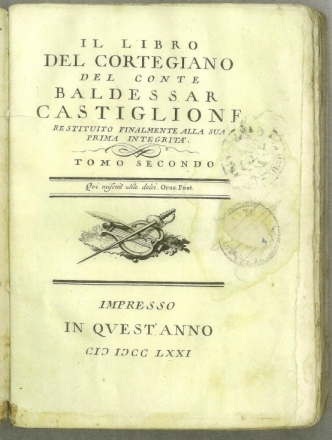 The book is based on a nostalgic recreation of Castiglione's experience at the court of Duke Guidobaldo da Montefeltro of Urbino at the turn of the sixteenth century. It describes the ideal court and courtier, going into great detail about the philosophical and cultured and lively conversations that occurred at Urbino, presided over by Elisabetta Gonzaga. 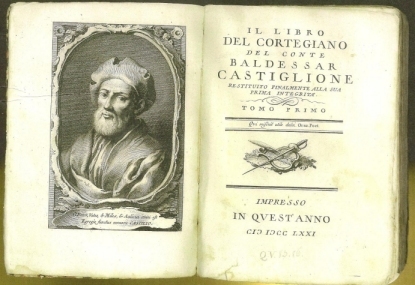 Castiglione himself does not contribute to the discussion, the book is his tribute to his friendship with the participants of the discussion, all of whom went on to have important positions. The Book of the Courtier caught the "spirit of the times" and was soon translated into Spanish, German, French, and English. One hundred and eight editions were published between 1528 and 1616 alone. (Pietro Aretino's La cortigiana is a parody of this famous work.) Castiglione's depiction of how the ideal gentleman should be educated and behave remained, for better or for worse, the touchstone for all the upper classes of Europe for next five centuries. The work on chess is in the second book of this work. Old stamps to title of volume two and first un-numbered page of volume one, Spine ends chipped with loss to heal, corners bumped, wrappers rubbed else a good copy of scarce title.